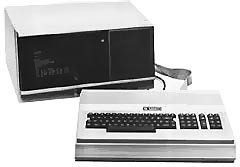 The Sanco 7000 was sold with the Microsoft Basic interpreter (V.4.45) and KBasic, a special basic which allowed advanced data management. Notice that the sanco 7000 has a 1 KB ram used for cache disk. More than 5000 Sanco 7000 were delivered, mainly in France. see more Sanco 7000 Ebay auctions !